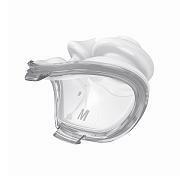 The AirFit P10 nasal pillows mask is part the new AirFit series; the right fit for you. This is the quietest mask yet from ResMed, offering the reliability and performance of the Swift FX in a design that is light and quieter by approximately 50 percent*. A study also found that patients using the AirFit P10 slept more than 40 minutes longer per night**. In a recent clinical study, ResMed found that patients slept more than 40 minutes longer per night when using the ResMed AirFit P10**. That is almost five hours per week of additional sleep, helping ensure patients will stay compliant with their sleep therapy. Dual-wall technology with trampoline action seals on contact, dispersing air gently to the nose. Key-clip nasal pillows off effortless assembly, with colour coding for easy sizing and left/ right orientation to ensure patients fit mask properly. Innovative flexi tube is ultra-light and flexible yet highly durable, offering patients full freedom of movement without compromising seal. 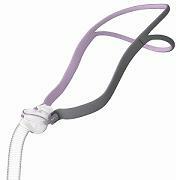 QuietAir woven-mesh venting quietly directs exhaled air, so it is barely noticeable to patients and their bed partners. 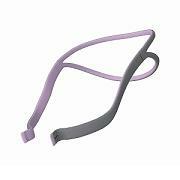 QuickFit elastic headgear with unique split-strap design provides stability and adjustability with minimal facial contact. The AirFit P10 for Her is designed especially for women, offering a smaller size designed for female facial contours, along with stylish tones and highlights. Excellent service, quick answer, super fast shipping. I will recommend to everyone. Good by email and over the phone. Machine arrived already programmed ready to use. will do buisness again. Purchased a cartridge filter kit for my SoClean 2. Service was better than expected. The item shipped immediately and received promptly. I could not have expected better and will definitely use CPAP Clinic again for any of my CPAC equipment purchases. Thank you CPAP Clinic, for the great service!